Bearded irises are the most widely grown group of irises (Iris spp.) in horticulture, according to the American Horticulture Society in its book "A-Z Encyclopedia of Garden Plants." It is France's floral emblem. The bearded iris is sometimes assigned the botanical name Iris germanica, which is problematic because modern varieties are complex hybrids. 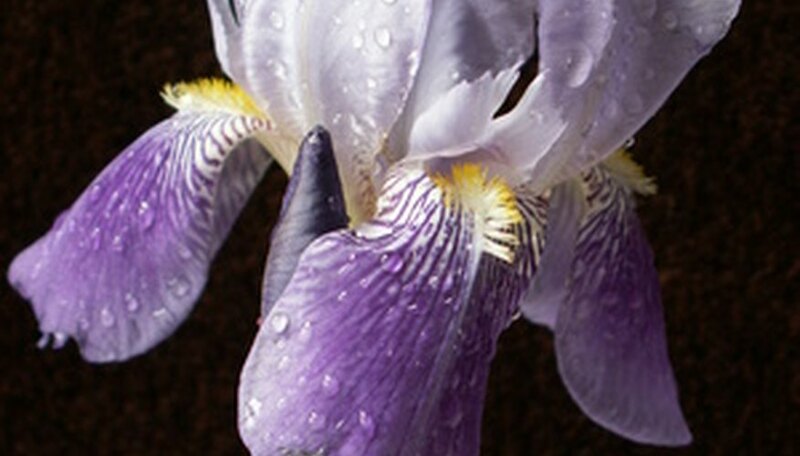 Bearded irises grow in U.S. Department of Agriculture winter hardiness zones 3 through 8. 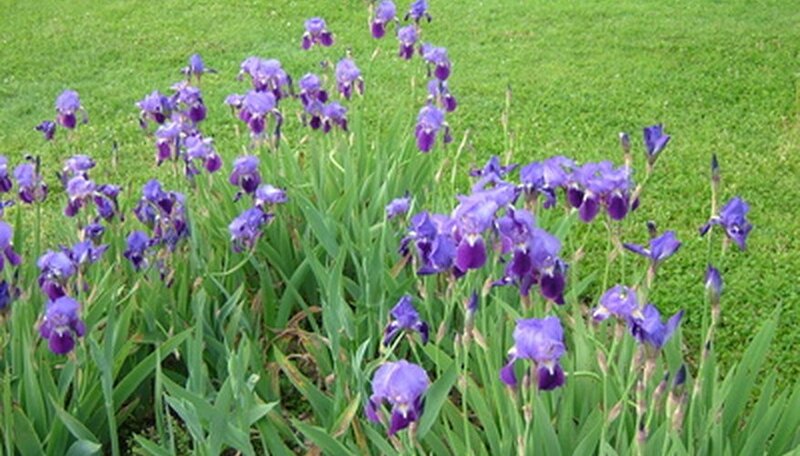 Bearded irises grow from thick, firm, horizontal stems called rhizomes that grow close to the soil surface. Roots emanate from the rhizomes into the soil. The size of the rhizomes varies considerably because bearded irises include miniature dwarf types as well as tall types. The rhizomes develop sword-shaped broad leaves that are arranged in a basal fan-like cluster. The leaves grow in the same plane, usually described as equitant. 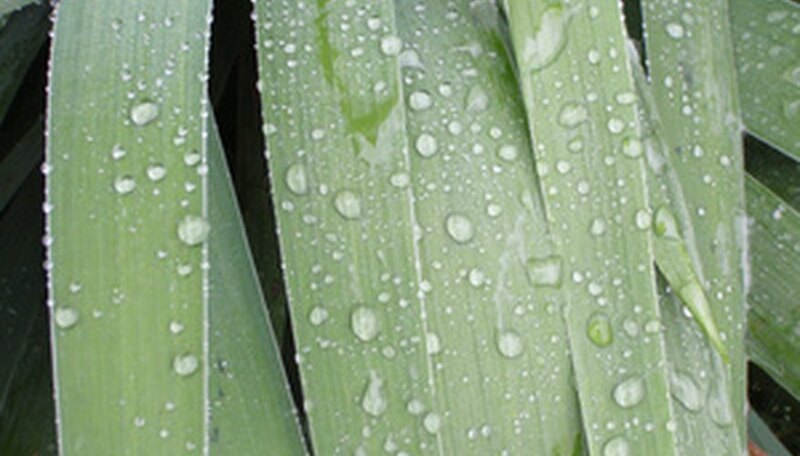 Leaves may be held stiffly upright or may flop over on varieties with long blades. Color ranges from blue-green to light green. Seeing a bearded iris' blossom definitely reveals its inclusion into the group. Flower petals can be white, pink, lavender, violet, purple, black, rust, blue and orange. True red is elusive, although iris breeders strive to develop a hybrid bearded iris with this color. The flower's structure comprises three large pendent petals referred to as "falls" and three upright petals called "standards." In the center of each fall petal on the curved shoulder called the "haft" is the cluster of furry hairs or "beards" that produce male pollen. In the flower's central core are three-part styles or female organs that spread over the hafts. Depending on variety and genetic lineage, bearded irises bloom from early spring to early summer, and some will rebloom again in autumn. These reblooming types are called "remondant." In the Northern Hemisphere, the blooming season correlates to April to mid-June with possible reflowering in September or October. 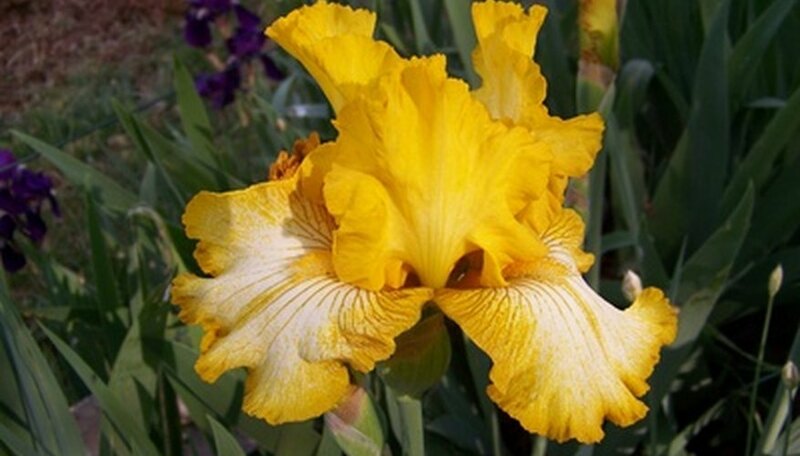 Although there are always exceptions, bearded irises in general will be in bloom before Louisiana and Siberian irises. 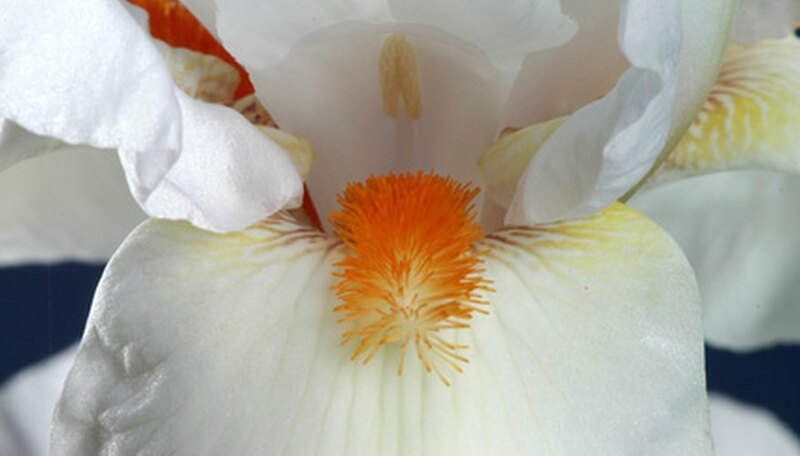 Bearded irises are classified for garden use and display based on their bloom season and height of the flower stem. The groups are miniature dwarf (height 8 inches or less, 1- to 2-inch flowers); standard dwarf (height 8 to 15 inches, 3- to 4-inch flowers); intermediate (height 16 to 27 inches, 4- to 5-inch flowers); miniature tall (height 16 to 25 inches, 3-inch or smaller flowers); border (height 16 to 27 inches, 4- to 5-inch flowers); and tall (height 28 to 38 inches, 4- to 8-inch flowers).